…Or, Guess Who’s Not Coming to Dinner. See, on Thursday Gist and I took a S******* Family Holiday (that’s what we call it when we take a personal or vacation day to spend some time together doing something fun) and we headed down to Boston to visit the Museum of Science. After our trip to the museum, we decided to have our favorite holiday meal of all – linner (that meal that senior citizens eat between 3:00 and 4:00, not quite lunch but not quite dinner) and we decided to go to one of our favorite places, Picco in the South End. Picco stands for Pizza & Ice Cream Company and that, my friends, is my idea of heaven. As an added bonus, they also serve my favorite hard-to-find beer, Allagash White. This was especially exciting because our limited budget has all but eliminated eating out for us. Usually when we go to Picco, we split a salad, large pizza and dessert – it’s the perfect amount of food. 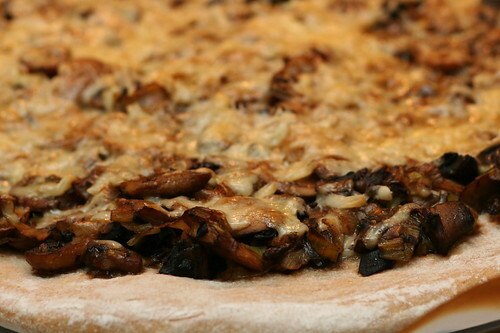 When we got there, however, I noticed that their special pizza was Mushroom, Caramelized Onion, Garlic & Fresh Mozzarella. I said to Gist “I know what I want.”, she replied “I know but that’s not what I want.” This was Thursday and I had already planned on making Mushroom-Leek Pizza on Friday because Gist wouldn’t be home. Did that stop me from ordering a small Special Mushroom Pizza for myself? It did not. So what I am confessing here, my friends, is both a meal out and the fact that I can eat insane amounts of mushroom pizza – I literally had it for linner on Thursday, as a snack on Thursday night, as Friday night’s supper, for lunch on Saturday, and I think I’ll probably have it for dinner too. There may even be enough left over for lunch on Sunday! When I contemplate that long string of mushroomy meals, my heart does a flip of joy. 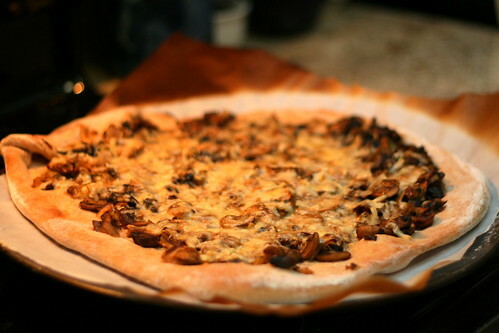 This is the second mushroom pizza recipe I’ve posted on this site and, fear not, I have a few more in my “Recipes I Like” file. I am also going to be trying to re-create that Picco pie sometime in the future – it was gooooood! 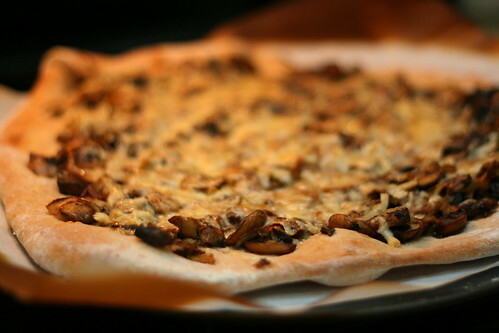 This particular mushroom pizza comes from Fields of Greens by Annie Somerville. I love Annie Somerville. She is the executive chef for Greens Restaurant in San Francisco, my absolute favorite restaurant ever. I am so thankful that I ate at Greens a good number of times while I was living in SF. If you visit the city by the bay, please stop by Greens for me – you won’t be disappointed! 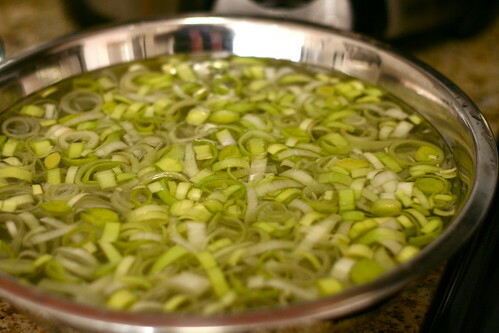 …And do the same with the leeks. Finally, you’re ready to prepare your pizza! 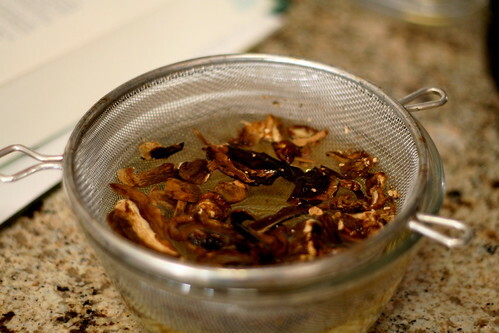 Soak the porcini in 1/2 c warm water for about 15 min; strain and save the liquid. Finely chop the porcini. 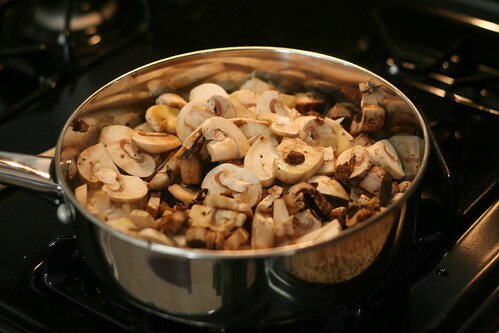 Heat 1 Tbsp oil in a saute pan and sear the white mushrooms (I read the recipe wrong here the first time I made it and I added the porcinis with the rest of the mushrooms – I continue this mistake to this day) over high heat with 1/4 tsp salt and a few grinds of pepper. They may stick but don’t stir them. Cook until golden then stir and continue to sear for 1-2 min. Add the Porcini liquid and simmer until the pan is nearly dry. Reserve the mushrooms. 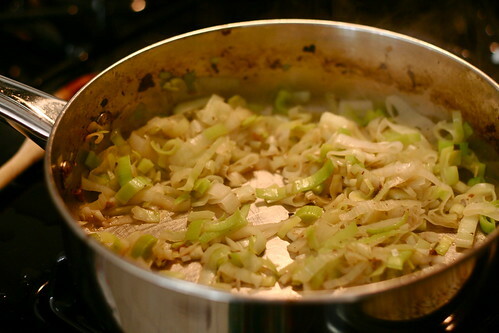 Heat the remaining oil and add the leeks. Saute over medium heat with 1/4 tsp salt and a few pinches of pepper; when they begin to soften add the garlic and porcini. Cover and steam for about 5 min or until the leeks are tender. Add the wine to deglaze the pan and simmer until the pan is nearly dry. Season to taste. Add to the mushrooms. Heat the oven to 500F. Roll out the dough and place in a lightly-oiled pizza pan. 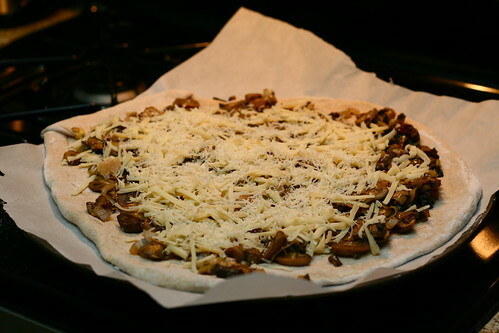 Spread the mushroom-leek mixture over the dough. Sprinkle a mixture of the Gruyere and 1/2 the Parmesan over the top and back for 8-12 min. Remove from the oven and sprinkle on the remaining Parmesan. Enjoy! * I generally make my pizza dough in my bread machine. It’s easy and cheap. If you don’t have a bread machine, you can always make it by hand (hard-core) or buy pre-made pizza dough or crust. Categories: $60/Week, Adventures of the Cash Poor and Time Rich, budget, Eating, Food, Lowell, Lowell MA | Tags: $60/Week, Annie Somerville, budget, Cooking, Cooking Yum!, eating on a budget, Fields of Greens, Food, Lowell, Lowell MA, Recipe, Vegetarian | Permalink. Hi my name is Marianne Gries, welcome to Art is the Handmaid of Human Good. I use this space to write about and share pictures of things that interest me. That includes my life in Lowell, my adventures in car-lite living, the food I cook and eat, my dogs, home improvement projects, vacations, knitting, and interesting things and places I see and visit. Thanks for stopping by!